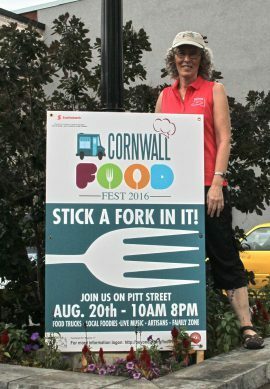 Cornwall, Ontario – Downtown Pitt Street will be bustling with activity on Saturday, August 20th as people of all ages participate in Cornwall’s second annual Food Fest, the city’s celebration of food! 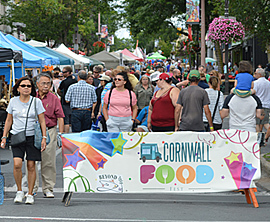 Cornwall Food Fest is a vibrant street festival filled with music, food, artisans, shopping and fun! Bringing the community together, the festival gives everyone a chance to celebrate what the city has to offer. With 18 food vendors participating, festivalgoers will be offered both hometown favorites and new, exotic flavours to try. From local eateries like Moustache Joe’s and Sheep’s Head Bistro, to food trucks like Rico Peru and Big D’s Dog House & Poutine Emporium, Food Fest offers tantalizing eats for everyone to enjoy. The sounds of live music will serve as the backdrop for the festival the entire day as local musicians are featured in the Entertainment Tent. Pommier Square will also be featuring a dining area with live music by Pamela Cummings and Dylan Groulx at 6:00 pm. The festival will be featuring over 30 local artisans and vendors. In addition, every downtown store will be participating, and with each purchase made festivalgoers can enter for a chance to win $200 downtown dollars. 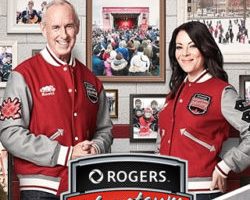 From 11:00 am to 5:00 pm, Pommier Square will be home to the Kinsmen Family Zone. The square will be filled with kid-friendly activities including crafts, face painting, dance and the magic of David Jans. This year, for the first time ever, Cornwall Food Fest will be partnering with CoTiCon, Cornwall’s full-day convention for anime, comic and geek culture enthusiasts at the Civic Complex. This will include a parade of costumed individuals going through Food Fest at 11:00 am. Click here for more information about CoTiCon! 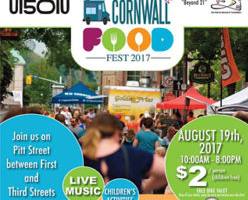 Cornwall Food Fest will run on Saturday, August 20th from 10:00 am to 8:00 pm, between First and Third streets on Pitt Street. Admission to Cornwall Food Fest is $2, and all proceeds will go towards Beyond 21, a local community program that supports developmentally challenged adults aged 21 years and older. This is the largest fundraiser Beyond 21 hosts, and there will be Beyond 21 Ambassadors at the event sharing information about the organization and explaining the impact the proceeds will have.